Sweet and Sarcastic: How I Wear "Pretencious." Shane told us that Cathy was a real champ (even making jokes throughout the labor). He also mentioned that he was told that the birth would be horribly messy, like the worst mess imaginable. He, therefore, imagined holding up his son, hands so drenched in blood that it was dripping down his arms and shirt. So compared to THAT, it wasn’t so bad. Cathy: My dad brought his favorite teddy bear from [South Africa]. Dawne: I’m sure that he saved something special for each of his grandchildren. Me: NOPE. Cathy is his favorite. Lucas: I better make sure that the woman I am going to marry has a high pain tolerance before I ask her to marry me. Me: How are you going to test it? Lucas: Sorry, I pushed you down the stairs. Accident! Lucas: Nice! A sword training so he can be a young beast master. Lucas: What does this “Baby code” and “Adult code” mean? Shane: It’s a new ID system. Lucas: My inner sole is worn. Me: Metaphorically? Your soul is tattered and torn by the hardships of life? Lucas (point to shoe while I give him a hard time): No – look. It’s worn down to the core. Use your eyes! Laina: Do you watch big love? Mark: I like the idea. Mark: I believe in not using a dirty catheter. That's a good message but I don't want to hear it. Jen: Is this a big enough problem that it needs to be a commercial? That’s the real concern here. Mark: I was reading Morley and Me to a girl and I was getting choked up but she was bawling. Me: She must have looked like a mess – you should have slammed the book closed. Mark: And said “Is this how you're going to behave!? DOGS DIE. That’s right. Me: How about that planet made of diamonds they found. Lucas: I bet diamonds are so not a big deal to them. Me: Today, I bet they’re version of D-Bad is Diamond Bag (Instead of Dirt Bag). Lucas: I think most people mean douchebags when they say D-Bag. Me: I know, but that ruins my joke. Lucas: Speaking of which I’m making a list of all of the things I hate. Me: Do you hate the people who are douchebags or the object? Lucas: The people – maybe I should but that in parenthesis. Me: I'm fired up, frankly. Rollie: that would be a great shirt, front: FRANKLY, back: I'M FIRED UP. Mat: we should start a T-shirt company, Tiff you write all the T-shirts and I'll design them. Better yet Tiff you just talk and Rollie will tell you when something is T-shirt appropriate and I'll design them. Me: My assignment: Talking. Done and Done. Rollie: I like that, when do I get paid? Mat: when you produce results, and you have to go through a review process, and set goals yearly. 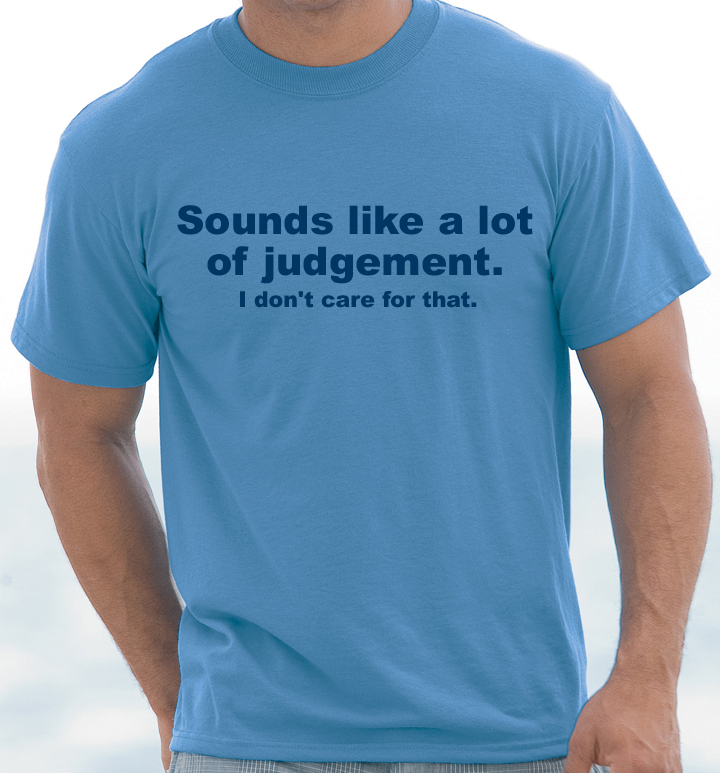 Me: sounds like a lot of judgment. I don't care for that. Mat: Could that be a T-shirt? Rollie: Frankly I’m a little less fired up about all this. I can’t take anything seriously. I’m not so good with the Listening. To whom would you grant a second chance? *But I spelled it “Pretencious” ironically. Later, we were kidding around about no one being perfect and that everyone’s hands are metaphorically unclean. I was like, “Man! That’s what I should have put on my shirt, “My hands are unclean.” And then people would have been like…uh, you didn’t make my dinner did you? Gross. After that, I headed over to Hudson’s for Jen’s belated birthday dinner where the topic of Google + and circles came up. Jen: Michael has one of those too with a totally different meaning. Then we headed out to Goldies/Bogarts for Karaoke where I crashed and burned trying to sing I Try but Macy Grey (I totally don’t know anything beyond the chorus, now I know.) But didn’t COMPLETELY butcher the Sesame Street Theme Song, so I guess we’re a-ok. Now, I also recorded Shana singing some Cher for Jen, but I’ll have to post that later because I’m having some technical issues. But when I do... it's going to wrap this up REAL NICE.